- Ideal for starting seedlings, protecting young plants or to get a head start or extend the plant growing season. Measures: 56" wide x 29" deep x 77" high. - Lightweight and easy to assemble, no tools are required. Sturdy steel tubular frame with a removable clear PVC canopy. Includes tie down rope and anchors. - 6 steel wire shelves for holding seed trays, pots and tools. 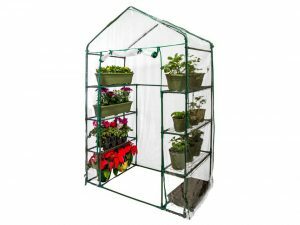 Roll-up front panel with double zippers allow easy access to plants and seeds. - It's great for use on patios, balconies, decks and gardens. A greenhouse makes gardening more enjoyable, as it's much easier to grow and tend to your plants! - 100% SATISFACTION GUARANTEE: Buy with confidence, if you're not satisfied with this item at anytime within the first year of purchase, we'll provide a refund or replacement.